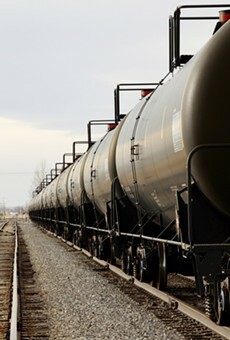 New York certainly hasn't been immune to the oil train boom, particularly in Albany where a company's plan to enhance its crude oil transfer terminal has generated a lot of controversy. And the Rochester area, too, has crude oil-carrying trains coming through it (see "Rochester's crude awakening" in this week's edition of City). This morning, the New York politics-heavy news site Capital published an article plainly headlined "Energy secretary: U.S. infrastructure unready for rail-crude boom." And because I knew that oil trains are rolling through Rochester, the article really grabbed my attention. Moniz's statements in the article, give the impression that he supports increased pipeline development. And while more pipeline capacity may be get crude oil off the tracks, it still isn't going to sit well with folks who want the United States to move away from domestic fossil fuel extraction and who are fighting projects like the Keystone XL pipeline.